Met Pigmon for an early lunch at Lao Shanghai, the newest part of Tony Hu's ever expanding empire and came away feeling quite positive given Lao Shanghai has been open less than a week. Xiao Long Bao (soup dumplings) a specialty of Shanghai were the first order of business, I liked the meat savory bite of the quail egg size filling, though the soup was mostly absent, Pigmon, who has eaten, researched generally given more reflective thought to Xiao Lung Bao than the most Chinese culinary historians, was objectively honest as to scarcity of soup when Tony Hu came over to inquire. Tony, detail and customer focused fellow he is, immediately had the kitchen prepare another basket, which he ate with us. Lao Shanghai's menu contains some crossover from Lao Sze Chuan, though we stayed within the Shanghai Specials section, starting with melting tender braised pork belly w/ preserved bean curd (fu yee/tofu cheese), which gave the rich belly a mildly salty umami laden tone. Braised pork belly with preserved bean curd sauce and spinach. I found the braised meat ball with crab meat bland, though liked the loosely packed structure. It also seemed, given it's one of the more expensive items on the Shanghai menu, crab should be more prominent. It will be interesting to order it in a month and see how it has evolved. Dried bean curd noodle with Chinese ham (dry cure ham) hit a high note for me, chewy toothsome noodles, dense lightly salty julienne of ham and lovely tender baby bock choy. Light, almost refreshing, perfect counter point to rich pork belly. Chinese ham with dried bean curd noodle. Lao Shanghai open less than a week, has a few minor kinks, though considerably less than most brand new restaurants and, if Lao Sze Chuan is any indication, will quickly become a fine addition to Chicago dining. In addition to Lao Shanghai Tony Hu has opened Lao Beijing, also in China Town Square. There is yet another new restaurant in China Town Square, Hing Kee, which, from a brief glance at the window posted menu, seems a bubble tea pan Asian venture. In addition to Pigmon's Xiao Long Bao post, referenced above, Trixie-Pea's lovingly detailed Xiao Long Bao Recipe post should not be missed. Did the second batch have more soup? Cathy2 wrote: Did the second batch have more soup? Yes, slightly more soup, but not as much as one might wish. Any reports on Lao Beijing? jonathanlehman wrote: Any reports on Lao Beijing? We went late last night around 930 and were the only customer there until closing time. Feelings were similar to G Wiv if not a little more underwhelmed. We had ordered spinach/tofu salad of sort (sorry, fogot the menu item name) which was very good, Tofu w/ Crab Meat which was a little bend on its own (it was served as if it was a soup?) so I put a bit hot sauce on it and ate it w/ rice, sauteed fish filet w/ mushroom (passable), and xiao long bao. Nothing jumped out at us really. As far as Xiao Long Bao was conerned, upon initial bite of the top of the tip to take a look at the juice inside, I had high hopes, there were amble amount, and the skin was holding up well. Then once I bit into the rest of it, it appears the juice was just that, juice, not a liquified version of aspic, which would provide that rich, filling and greasy flavor in your mouth as it explodes. LSH's version didn't. Maybe I'm just feeling a little down after my Vancouver trip. G Wiv wrote: There is yet another new restaurant in China Town Square, Hing Kee, which, from a brief glance at the window posted menu, seems a bubble tea pan Asian venture. Hing Kee's "old" in a sense - was previously the only pho place in South China Place (China Town Square). It's gone through a change in owndership, and gone through a re-model a la Joy Yee's in an effort to steal (which they seem moderately successful) customers away from Joy Yee's (which has also moved/expanded/remodeled). Initially the food at Hing Kee's was horrible... It seems to have changed to classic HK-style cafe food. They've got a $1.99 dine-in wonton noodle special going on that we saw on the window. See the first reviewer (and please ignore the Yum-O reference). My friend from Shanghai, Joseph, told us he saw this new restaurant and stopped in to look at the menu. He said they were speaking shanghainese so he wanted us to try it, (even though he had read a review on the internet saying the potstickers weren't as good as Ed's - but, he said, potstickers aren't from Shanghai, they're from the north.) He said he wanted to order only specifically Shanghai dishes, and so we gave him free rein, (as we usually do in a chinese restaurant). We had a great meal! 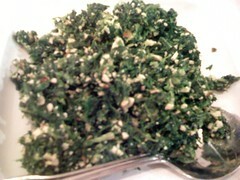 We had the vegetable and tofu salad (looks like dry tabouleh), another vegetable salad of some dark stuff (mushrooms? seitan?) and dark shredded vegetable and peanuts. Then we had bamboo shoots (not the ordinary kind, Joseph said), with some herb he didn't know the name of in english, then yummy, chewy, seared rice disks with onions and pork, a bowl of slithery eels, and for me, the sloppy vegetarian, a (non-shanghai) dish of crusty-tender tofu stir-fried with tons of hot peppers, garlic, ginger, and scallions, then a beef and onion dish that my meat-eating friends loved, and finally a ham soup (Joseph said this was only so-so). Everything tasted fresh with lots of different flavors from the Szechuan food we have at Lao Szechuan. I didn't have my camera, and at the end I remembered to take some photos with my cell phone, but now I'm not sure how to get them on here, so I'll just leave them off. All in all, an excellent meal if you stick with Shanghainese dishes. Pucca wrote: Was the "skin" thin? I thought Lao Shanghai's Xiao Long Bao (soup dumpling) skin slightly thick, but not egregiously so. Pigmon, who, as I mention upthread, has much greater XLB experience than I, specifically mentioned the XLB skins were three or four times thicker than he would have liked. Just to clarify, Lao Shanghai was open but a couple of days at that point, I'd imagine they were, and still are, refining menu items. Sigh - my wife and I ventured out into the cold this weekend to try Lao Shanghai. I especially like xiao long bao so ordered that as soon as we sat down. When the steamer came out I remarked that it was odd there was no steam. I put a dumpling on the spoon and took a tentative bite off the top of the dumpling. Not only was the dumpling not hot, the inside was raw. The staff was apologetic, but come on!!! Don't serve people raw xiao long bao. the skin was whitish, but the ones I had recently at DTF in Arcadia looked simliar. Would someone like to sponsor an educational trip for me to become a xiao long bao apprentice in Shanghai so I can come back to Chicago and set up a shop? The Xiao Long Bao there tasted like the frozen ones made by Wei Chuan - you can buy them from Asian grocery stores. queryrunner wrote: The Xiao Long Bao there tasted like the frozen ones made by Wei Chuan - you can buy them from Asian grocery stores. Curious, because I've never seen frozen xiao long bao, I glanced at the Wei Chuan homepage...which doesn't offer xiao long bao(doesn't mean they don't manufacture them, I suppose). I just can't imagine xiao long bao freezing very well. Pucca wrote: Would someone like to sponsor an educational trip for me to become a xiao long bao apprentice in Shanghai so I can come back to Chicago and set up a shop? Just to rub it in, I just got back from Shanghai last weekend. And it was xlb-licious! Not only that, the sheng jian bao across the street was even better! So good, we went there 3 days in a row for breakfast! This is the generic version. They now also have a new version called Nanxiang Xiao Long Bao. Nanxiang is the most famous xiao long bao restaurant in Shanghai. They were called Mini Buns on this site. I have seen both at the Broadway Supermarket near Lawrence and Broadway. These buns actually freeze quite well because the soup inside came from frozen jelly. 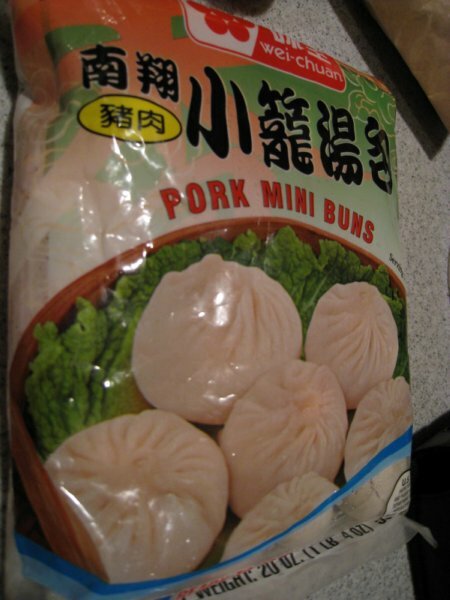 The packages in the second link, called "mini buns" in English, actually say Nan Xiang Xiao Long Bao on them in Chinese. Yes, and they are locally available at HMart. I haven't tried 'em yet. I want to steam them and always seem to be out of cabbage when I remember they exist. Thank you kindly(I do not read Chinese beyond my McCawley) and seeing "mini buns" I would assume they were run-of-the-mill bao. I steam them right on a small plate without leaves. The plate catches any soup that might otherwise get lost. There's still plenty of soup in the buns though. gastro gnome wrote: Yes, and they are locally available at HMart. Finally, with the help of a very kind cashier at H-Mart, I found and purchased these (IIRC, they are not with dumplings, but in the center aisle case farthest from the cash registers and near the fish cakes. I have no basis for comparison, so for true soup-dumpling junkies these may not do - but the whole family was instantly addicted. I like lao shanghai, for me the service has always been the best of the various outposts of the Hu empire and some items on the menu make me return - shrimp in crispy garlic, shanghai lo mein, and the asparagus with black bean appetizer amongst them. While I agree that their soup dumplings are not top notch, I have only rarely come across soup dumplings of any variety that I would not eat again. After arriving at Shui Wah yesterday, only to find it closed (permanently as we now know), I made my first visit to Lao Shanghai with family. The one item I was excited to try was obviously the xiao long bao, and it was also the most disappointing item we ordered. Overly thick skin, too sticky, too little soup filling, and not all that flavorful - honestly, maybe the worst XLB I've ever tried. But not all was lost. Vegetarian egg rolls were pretty good - very crisp with a well seasoned filling. Asparagus with black bean sauce might have been a little light in black bean sauce, but it was still quite flavorful with a vinegar zing. My favorite item was probably rice cake (noodles) with vegetables and a thick, slightly sweet soy sauce. Scallion pancakes were okay, but a bit too greasy and I've had much better. I was a little limited in items I could order with my less adventurous (and partially vegetarian) family, with my only demand the XLB (my very favorite Chinese food item and one I always seek out where appropriate), so I didn't get to try much that interested me. But with the star attraction (XLB) failing to impress, I'm not sure I see a need to return.